When installing a warning light inside a warehouse, business or other building, most users want to maximize the amount of visibility the light provides. After all, if the light is not visible, it can’t protect and warn against danger as designed. Mounting a safety light properly can maximize the visibility. Below are some tips and considerations for mounting a safety signal in or on a building. 1)	What color of warning light is the brightest? For strobe lights, amber and clear provide the brightest, most visible light. For LED-based lights, white, green and red colors provide the brightest output. 2)	Where is the best location to mount a safety light? To provide the highest visibility, warning lights should be placed between 6 and 10 feet off the ground. This places the light at or slightly above eye level. There should be a clear line of sight between the light and anywhere in the vicinity people will be working or gathering. If there is an obstruction in the line of site, multiple warning lights should be used so that wherever a worker or visitor is standing, they can see the visible alert of the light. 3)	What orientation provides the best visibility for a warning/safety light? 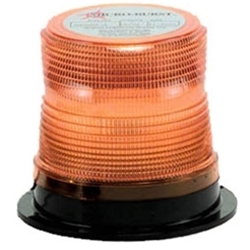 Safety lights that are mounted upright will provide the most visibility and light output for a given area. For many strobe lights and LEDs, light is not output from the top of the light. Mounting a unit horizontally may create a blind spot if the warning light does not shine light out of the top of the lens. The DFS350 and DFS625 safety lights are a great option that can emit light out of the top of the lens if the label is removed. 4)	What is the right voltage for a wall-mounted warning light? 120V AC is the most common electrical wiring for buildings in the United States. However, many buildings use a 24V DC battery backup system. If the warning lights are intended to warn during a power outage, a 24V version of the light will need to be wired to the backup power of the building. 5)	Can Safety and Warning Lights be mounted to electrical conduit? Most safety lights we offer are available with either a through-bolt permanent mount, or a 1/2” pipe mount for electrical conduit (NPT Pipe).